Since this is my hobby blog and I rarely have much time for hobby these days, here is a team of rascals I painted up a while back for playing demos at the local game shops. 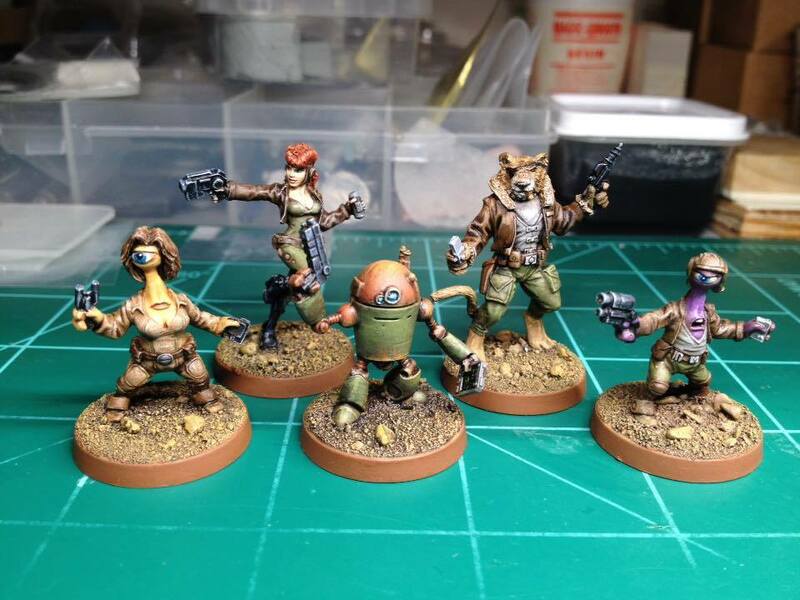 Not only are they painted by me, I also sculpted all of them and the weapons and robots were made in ZBrush. Commonly seen operating throughout the Outer Reaches and other regions of space are bands of miscreants, fortune hunters, and those merely struggling to survive. Known as 'Lancers', many are privateers or mercenaries seeking honest employment. Hard times can drive some to unlawful activities like smuggling or piracy while others embrace crime freely, tempted by the profits to be made in spite of the risks. Lancers hail from many worlds. Many species, such as Humans, Illyrians, Alanti, Shrinaar and even the rare Neiran exile may comprise Lancer crews. Some Lancers are loners, operating alone as bounty hunters, bodyguards, prospectors or other types of free agents. Most Lancers possess highly specialized skills, but all of them boast at least a modicum of martial skill, be it ranged or hand-to-hand. Indeed, some are highly renowned fighters. Their travels sometimes charted through the gray areas of law, Lancers are viewed as disreputable by many in the Galactic Defense Force and treated accordingly. Even Galactic Recovery Agency security teams will harass Lancers given enough provocation and in the absence of bribes. Needless to say, Lancers avoid these groups whenever possible. Their furtive behavior and the GDF and GRA's habit of shaking down even law abiding Lancer crews has made trust and cooperation between the two factions difficult. Lancers are found throughout the galaxy, able to thrive in highly populated systems as well as regions of space where law enforcement is weakest. There's always work for a Lancer if one knows where to look. Someone is always needing transportation to somewhere, protection from someone, or goods moved someplace and Lancers can provide these services on the fly. Learn more about Counterblast here.